Posted on August 8, 2011 by Al B. How are salmon doing in Puget Sound? Turns out, Chinook salmon are not doing too well according to a report recently released by NOAA, not any better now than 10 years ago when salmon species in Puget Sound were listed on the Endangered Species List. NOAA’s recent report highlights that we are still losing more habitat than restoring and have not addressed toxic pollutant runoff to a sufficient level to reverse the adverse effects of toxic pollutants on fish survival. The causes are many. Growing population around the Sound, destruction of salmon habitat, sometimes by people with the best of intentions, sometimes by raw greed, sometimes by lack of regulations and sometimes by lack of enforcement of the regulations. A century of storm water runoff that will take a century more to fix. And lets’ not forget that all major sewage systems, even treated, are dumped into the Sound. It’s not enough to say that we want to save the salmon, a huge public resource that could have been managed for generations to come to have low cost protein, but we have squandered that opportunity decades ago, and now it’s time to do what we can to bring them back. Watching the salmon derby winners on the Strait of Juan de Fuca bring in good sized fish, really huge for these days, In Gardiner, in February, 18 to 20 lb fish were caught, in Anacortes 16 to 18lb fish were caught, and in B.C. at the Juan de Fuca derby outside of Victoria, the top fish was 40 lbs, and the top ten all topped 25! This derby has raised over $200k (Canadian) to support salmon enhancement activities. The study by NOAA that Tom mentions in his blog, states that “The Co-Managers (the Washington Department of Fish and Wildlife and Puget Sound Treaty Tribes, collectively) met or exceeded the harvest management performance measures required in the 2004 Harvest Management Plan. Habitat restoration is heavily tilted towards capital intensive projects (think Elwha Dam). Funding levels are inadequate to achieve restoration of Chinook populations. Staffing for core programs remains insufficient. There is no process in place to recognize changes that are being made to recovery plan strategies as implementation proceeds. The Hatchery programs remain critically underfunded. How big could Chinook get? 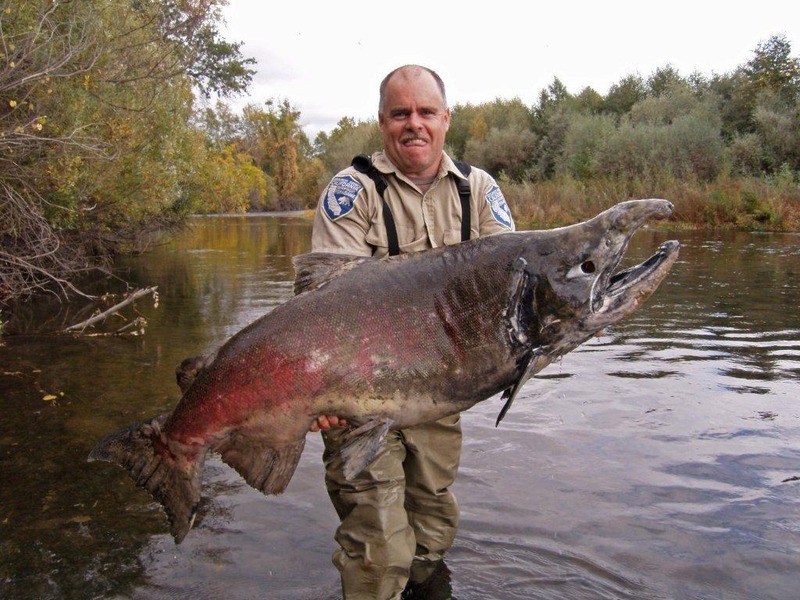 In 2008 a California Fish and Game Wildlife Biologist found what is thought to be the largest Chinook in modern times. It had spawned and died, and it’s body was found. Unaltered photo of actual Chinook body found in California in 2008. Notice the kind of habitat behind them. It’s not developed. Your support in helping local officials and non profits that are working to achieve these goals, including adoption of strong Shoreline Master Programs and Critical Areas Ordinances go a long way to helping protect our remaining salmon habitat and someday possibly seeing Chinook such as this in our Olympic Peninsula streams. Where is the stock for 100lb salmon?